Hi Beautiful People! I hope you all had a wonderful Thanksgiving holiday and I’m sure after all the delicious food on Thursday, there was lots of shopping afterward and today is Cyber Monday! So in honor of Cyber Monday, I got together with one of my favorite ladies at Macy’s, Jamet Jackson. Jamet is the Stylist at Macy’s here in Richmond, VA….Jamet is such a joy to be around and if you are in the need of getting an outfit for a holiday party or just getting a new look to your wardrobe, Jamet is the lady to contact…she’s truly gifted at what she does and she makes the experience so much fun! 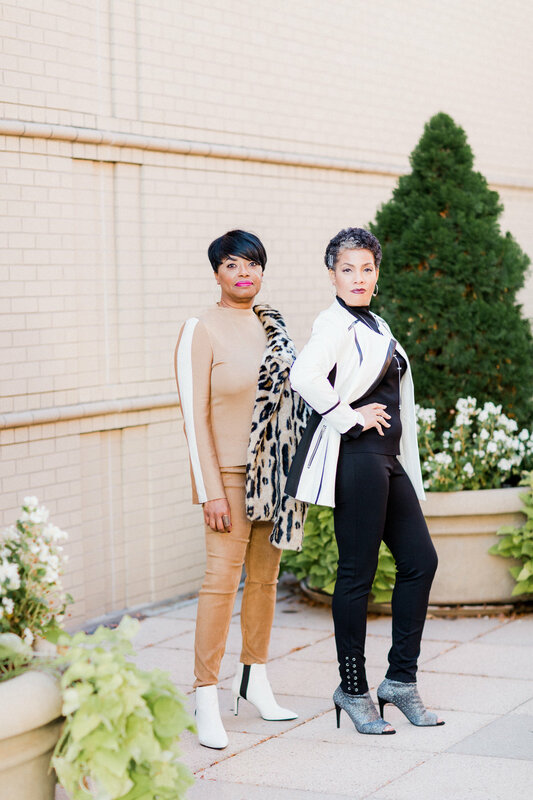 I met up with Jamet a week before our shoot was scheduled and we had such a wonderful time picking out our looks for the shoot….and all the pieces are on sale so now is definitely the time to shop! What I’m wearing…..I looooove this leopard faux fur jacket created by I.N.C (International Concepts) for Macy’s…..faux suede pull on pants in camel…..and the varsity-sleeve sweater in camel…..wearing my favorite white booties and gold accessories….all from I.N.C. and created for Macy’s! Jamet is wearing….all from I.N.C…..the faux-leather-trim moto jacket……varsity-sleeve sweater in black……and the lace-up skinny pants…..and the coolest sock bootie in pewter and silver accessories. Thanks so much to my girl Ali of Alisandra Photography for capturing all the fun for Jamet and I and a huge shout out to my girl Erika of Erika Nixon for my glam! Thanks so much for stopping by today lovelies…now get to Macy’s and start shopping these AMAZING deals!